Need DODGE INTREPID keyless entry remotes? Save up to 75% off dealership prices on key fobs for Dodge Intrepid! Lost or broken keyless remote key fob or transponder chip key for your car ? 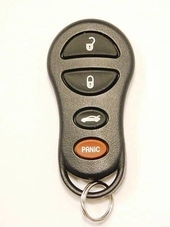 Dodge Intrepid remote controls or simply called key fobs can be replaced at a fraction of a dealership cost. Free remote programming instructions are included with the purchase.